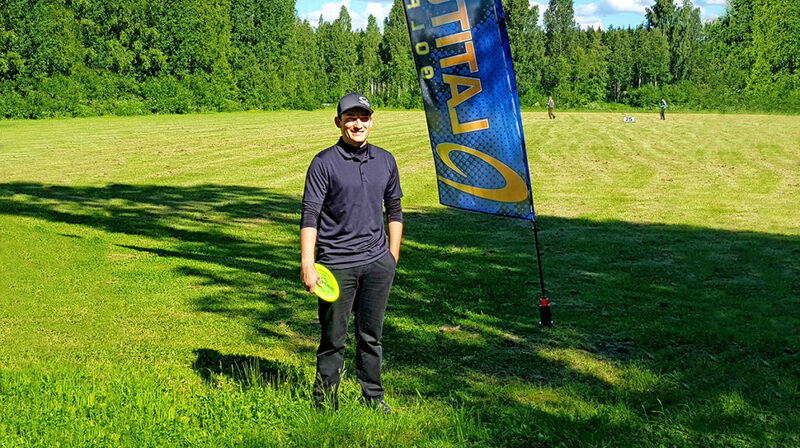 Jake Peters won the Next Generation Disc Golf Tour in 2016, and apart from winning a spot on Team 64° as Ambassador, he was also awarded a trip to the Latitude 64° hometown of Skellefteå, Sweden, to take part in the Skellefteå Open 2017 tournament this week. We caught up with him during the players dinner last night and had a quick chat. Hi Jake. Welcome to Skellefteå. For those who don’t know anything about you, can you give us a short introduction of yourself? 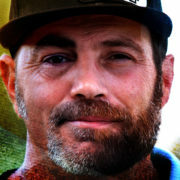 Yes, I’m from California and I’ve been playing disc golf for about eleven years now. I learned disc golf during a summer when a friend of mine YouTubed it. We went out and played, and I fell in love with it immediately. I spent five hours every day in the beginning and at that time we only had tone poles instead of baskets, and it wasn’t until a year later that I got to play with actual baskets and tee pads. I’ve come a long way since then. Being your first trip to Sweden, how do you like it so far? I love it. I was able to get here just in time for the Music Festival (Stadsfesten). It was right here next to the hotel, so it was great to walk around and see all the fun everyone was having, and experience the hospiality of the residents here. Everyone was very nice and inviting. What about the Swedish weather? It hasn’t really been that warm and fuzzy this week. Actually it’s a lot like the weather back home, we have all four seasons in the high desert in Northern California, where I’m from. Sometimes it can be very hot one day, and then very cold a couple of days later, so it kind of feels like home as far as the weather goes. I’m used to it changing very rapidly. 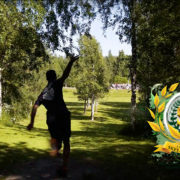 Coming into this event, the Skellefteå Open, what are your hopes and goals? I don’t have too many expectations coming in. I just gonna play shot by shot, throw by throw and hole by hole. I’ve spent the last five days practicing the course, and I got about seven rounds under my belt. I’ve figured out the landing zones for the par fours, and which par 3s I can attack, and which ones I need to stay in bounds on, take my medicine and take my par. That was a lot of fun, figuring out the puzzels of the course. So I’m really exited to see where my disc land and how I can attack after that. What’s your impression of the course? Some par 3s can easily be birdied, some have dangerous OB which demand respect. There are specific landing zones on the par 4s and the par 5 and par 6. If the sweet spots are not found, a player may be forced to lay up or get creative. If a player can make the corners on these holes it will open up the alley for an easy approach for the birdie. I plan to play aggresive to make the corners, but if the corners are not met I will take my medicine and lay up. Some baskets are next to water, and this needs to be taken into consideration as well. This is what makes the course world class. Any thaughts on the mosquitos? Actually the first day of practice on sunday there were quite a few mosquitos then, and they caught us by surprise on the par six. They just loved us, and decided to follow us for a few holes. We have a lot of mosquitos back home, but not quite like these ones. But since that round, I think they’ve moved somewhere else. Yeah, I think they probably froze to death actually. 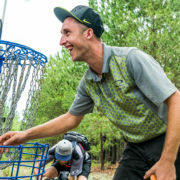 Winning the Next Generation Disc Golf Tour last year, has that had any impact on your plans and ambitions in terms of your ”Disc Golf future” so to speak? Pro Tour in sight maybe? Yeah, I’ve been playing a lot of pro events this year to prepare for all professional events moving into 2018. I learned about the Next Generation Tour, my first event, when it came to California, and after playing that event I decided I wanted to play the other events that I could travel to, and qualify for the finals. So I made up my mind to change out my whole bag to Trilogy discs, and had a good feeling that I was going to have a successful tour. I prepared and I practiced hard and even though it seemed that the cards where stacked against me, going to the finals, I decided that even if I don’t win the tour, I can at least win this final tournament, so I played my heart out and came out with a one stroke win, so it was very exiting. Moving forwards now since I’ve been added to Team 64°, it’s been very exiting to play for such a professional company. They belive in quality in their products and they stand by it. I’m really happy to represent such a great company. You visited the Latitude 64° factory today. Any special ”finds” you want to share with us? I’m really exited about the Matt Bell Mercy’s, I’ve found a couple already. If there aren’t any trees in the way they’ll just fly forever, so I’m looking forward to baging a couple of those. The other ones, mainly a lot of backups. The Recycled Saint is one of my favourite discs. I’m really enjoying the Flow, and the Culverin, a lot of the fairway discs. I don’t throw quite as far as some of the higher rated guys, so I stick to what I can do, the accuracy, and I think it’s working out for me so far. Have you had the chance to talk to Ricky yet? You know … ”picking his brain”? Anything else you want to share with the rest of the world? 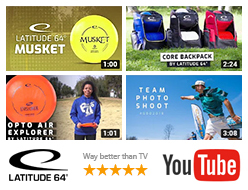 If your looking into getting som quality discs and representing a quality company, Latitude 64° is where it’s at. Finally, name three discs you absolutely can not live without. As I mentioned before, the Recycled Saints is one of my favourite ones. It just seems to find the target every time. If you want to make a lot of putts, I would suggest trying the Gauntlet. It has so much glide and just enough predictable fade, that you can really pin point where you want your putt to land. If you’re looking for distance, if you are a player that doesn’t throw that far, I would suggest the Cutlass. It has great turn, great glide and predictable fade. I really cant say enough about these discs and the predictability of Latitude 64° discs. You really can’t find any much better than that. Thanks for your time Jake, and we wish you good luck in the tournament and onwards.